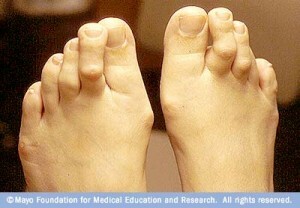 What are claw toes/ hammer toes /mallet toes /retracted toes? What are claw toes / hammer toes / mallet toes / retracted toes ? These terms are similar but different, though they all refer to toes that don’t sit flat to the ground when you are standing, but rather get an angular bend in the small joints of the toes. This means that one of the joints will rise above the usual thickness of the toes. This higher part is then prone to damage and rubbing from a shoe, as most shoes are only made for ‘normal’ feet. 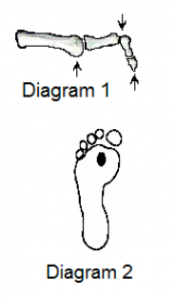 The apex or tip of the toe is also worse off as it has to bear weight on the point, where it is just skin and bone, rather than the cushioned pulpy part of the pad underneath (see diagram 1 below). This will often result in a hard patch of skin on the end of the toe called a corn and usually a deformed or painful toenail. Also, the metatarsal-phalangeal joint (the ‘knuckle’ that corresponds to that toe in the ball of the foot in diagram 2) – will almost always develop a bruised feeling that will progress to pain – often accompanied by a corn at that site as well. A small, fluid filled sack called a bursa may develop on the tops of clawed toes, particularly in fashionable women’s shoes where space is likely to be more restricted. To view this Q&A session about claw toes as a single document in downloadable / printable format, please browse to our Hammer Toes Info Sheet.